I have a complex model, which consists of a number of smaller models. I have tried to Ctrl+J and merge everything into one, but the automatic UV unwrapping ended up with utter crap, so I decided to do it by hand, edge by edge. Can you help me with that? Is it an optimal way of doing that? 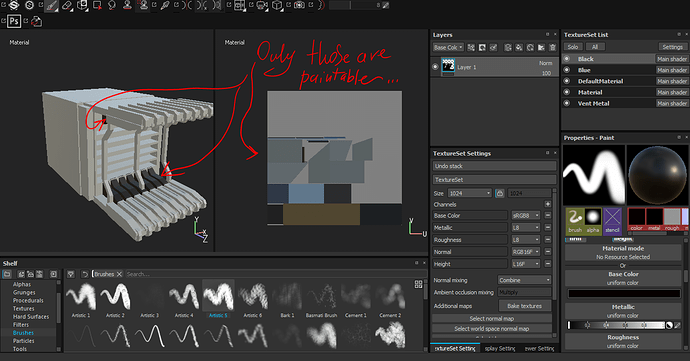 Will it be possible to UV-unwrap every single little bit, and then have a total texture map of the whole thing? There is my model, with a couple of sub-models selected, so you have the idea. First, make sure each separate object has its own vertex group before you join them, this will save you pain later as it lets you select said mesh by vertex group to remove it later if need be. But I would play around with https://www.youtube.com/watch?v=16ol-mp1kUs for a while and keep your eyes open for the island packer addons. Although this model looks like a candidate for having more then one uv map, I’m not sure what your target use is so I Can’t help you much more. This is basicly a thruster model for the game Space Engineers (mod). And I want to texture the whole thing in Substance Painter. If you are working in SP, really doesn’t matter if the map looks rubbish as SP will handle it fine, unless you want to paint in the UV window and not the viewport. I’d just go with smart project with a decent margin and not worry about it. “Vertex groups” are essentially a way to name a set of vertices so that you can easily identify and recall them, or otherwise refer to them as a particular group. The trick is to export all objects either as separate items and work on them individually, or select them all in Blender, export them all using “selected objects” in the FBX export and make sure eahc item has it’s own material name & uvmap, this will translate in SP to texture sets. If you need help, let me know and I’ll throw toegther a small example you can use as a test. Can you explain a bit more? What ‘material name’? Basically, each object has a different material, so if your item consists of say, a wall, some beams and a floor, then give each object it’s own material with a suitable name. This is the way I prefer to work in SP so the texture set lines up with the object. Using names like “material01, Material02” etc isn’t very helpful when working in SP. Lol, I think im a bid dumb now Where exactly should I look? If you look, the select item is ‘MainUnit’ and I have the material tab open and have given it a material using the same name. The 3 meshes, (parts of the item), are indicated by a triangle in the outliner (top right). Each one has a material assigned to it using the same name. Blender file, slightly updated, of the above. I export FBX using selected objects only, make sure to turn off “apply modifiers” under teh FBX export “geometries” tab, also set smoothing to face. 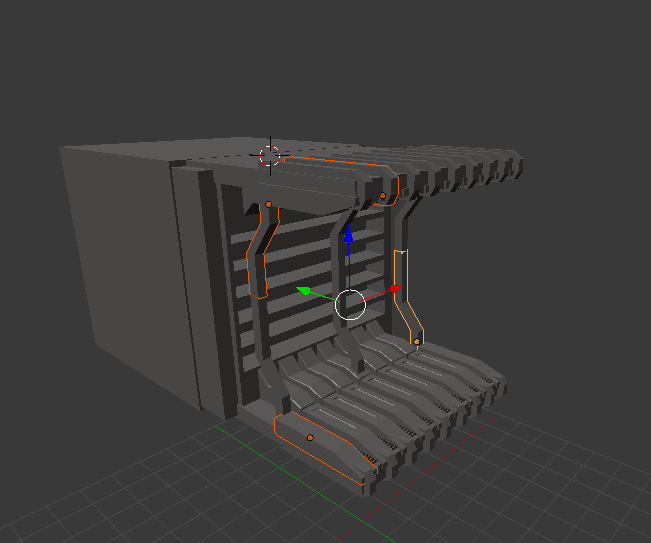 Also, how did you make such a smooth hard surface edges? That looks cool! 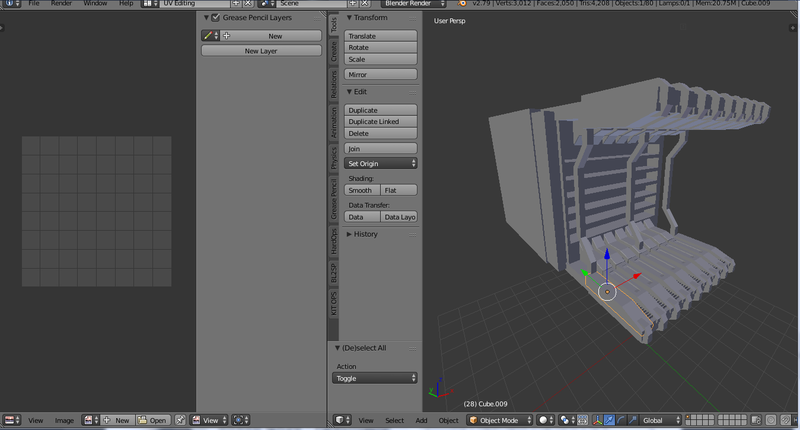 Ahh, I am working in Cycles, the Blender Internal engine is legacy and 2.80 will be Cycles and Eevee. 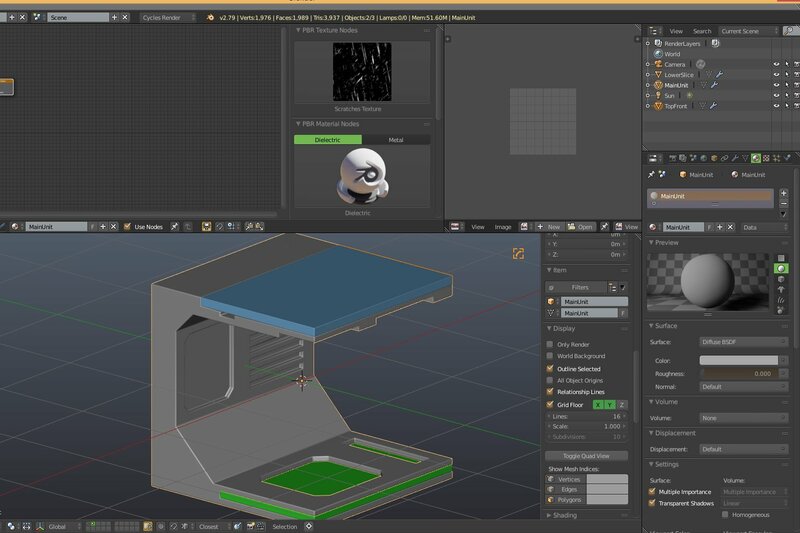 If you are very new to Blender, it can seem daunting, but taking your time and looking at a couple of youtube videos, you can get up to speed in no time. If you can upload the blend file here, I can use to it create a small video to show you how to go about it if you are interested. And here is the blend file. I have uploaded the blend file as you asked, dude And ye, Im really new to texturing, and substance painter. I also do not know nodes, materials and such. Only modelling is what I can do. Ok, I’m finishing up a tutorial on HardOps & BoxCutter (paid addons). I’ll take a look at your file and build a guide around it once they finished encoding.